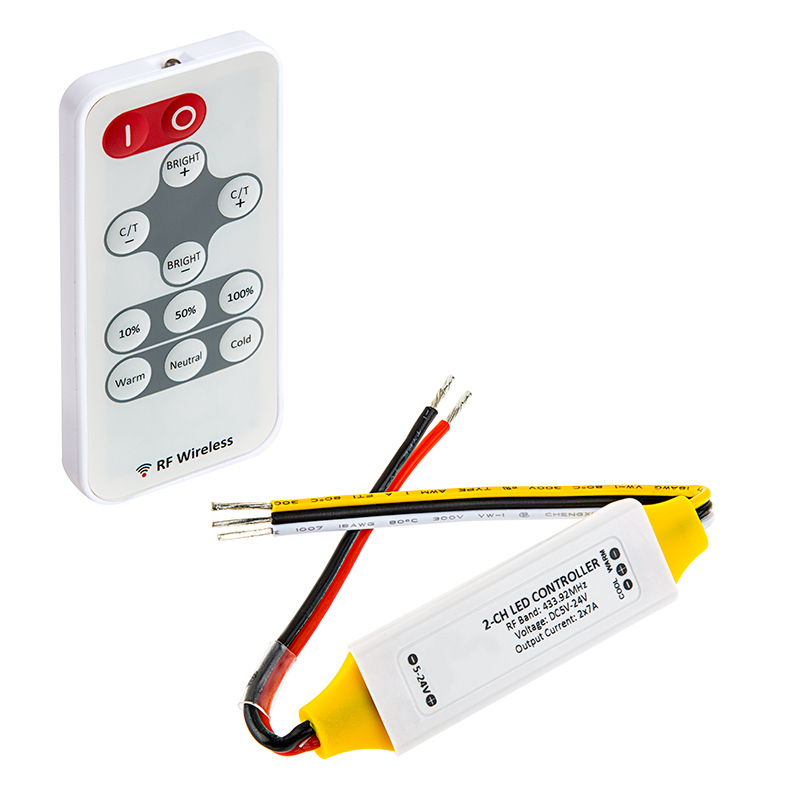 This tunable white LED controller with wireless RF remote is perfect for operating your tunable white LED light strips. The LED remote has adjustable brightness (2%-100%) and color temperature controls, and it can operate your light strip from greater than 50' away in open air. Power-cycle mode retention allows your light strip to return to the brightness level and/or color temperature that was selected before it was powered off. The waterproof controller has a maximum load capacity of 7 amps per channel and is compatible with LED light strips that operate within a 5-24V DC range. 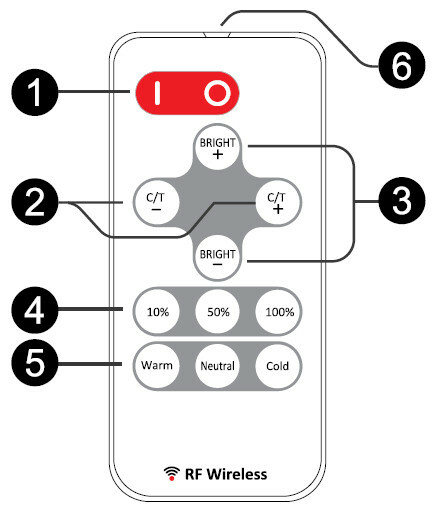 Use 1 remote to control an infinite number of receivers, and pair up to 5 remotes with one receiver. Includes remote battery. Turn On/Standby: Press 'I' key to turn on unit or press 'O' key to turn off. Retains last setting between power off and power on. Color Temperature Adjust: To control color temperature, press 'C /T+' key to increase color temperature by increasing the cool white channel output power and decreasing warm white channel output power. Press ' C /T-' key to lower color temperature by increasing warm white channel output power and decreasing cool white channel output power. The overall brightness will remain unchanged when adjusting color temperature. Brightness Adjust: Press 'BRIGHT+' key to increase brightness and 'BRIGHT-' to decrease brightness. The color temperature will remain unchanged when adjusting brightness. Brightness Shortcut: Press one of the shortcut buttons to set the relative shortcut brightness level. 3 shortcut keys '10%' , '50%' and '100%' are available. Color Temperature Shortcut: Press one of the shortcut buttons to directly select the relative color temperature. 3 shortcut keys 'Warm, 'Neutral' and 'Cold' are available. 'Warm' and 'Cold' is pure warm or cool output, 'Neutral' is half warm and half cool output. Wireless Remote LED Indicator: Flashes blue when remote is operating to indicate that the remote is functioning properly. Power Supply Wiring: The controller/power supply operates at 5-24VDC. The red wire is positive(+) and the black wire is negative(-) as indicated on the controller housing. Make sure the power voltage matches the LED strip. Incorrect voltage may damage the LED strip requirement. 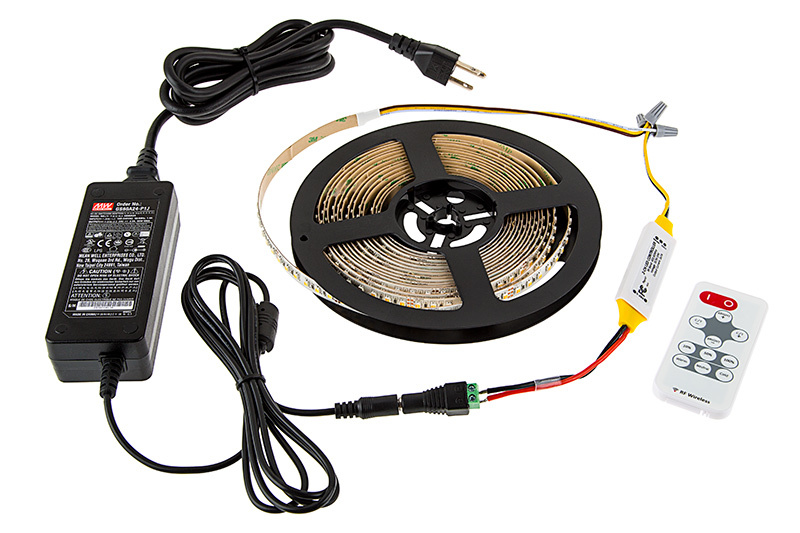 LED Output Wiring: The black cable on the output side should be connected to LED positive, the white cable should be connected to cool white LED's negative and the yellow cable connected to warm white LED's negative. Prepare the wireless remote for use by removing the battery insulator. 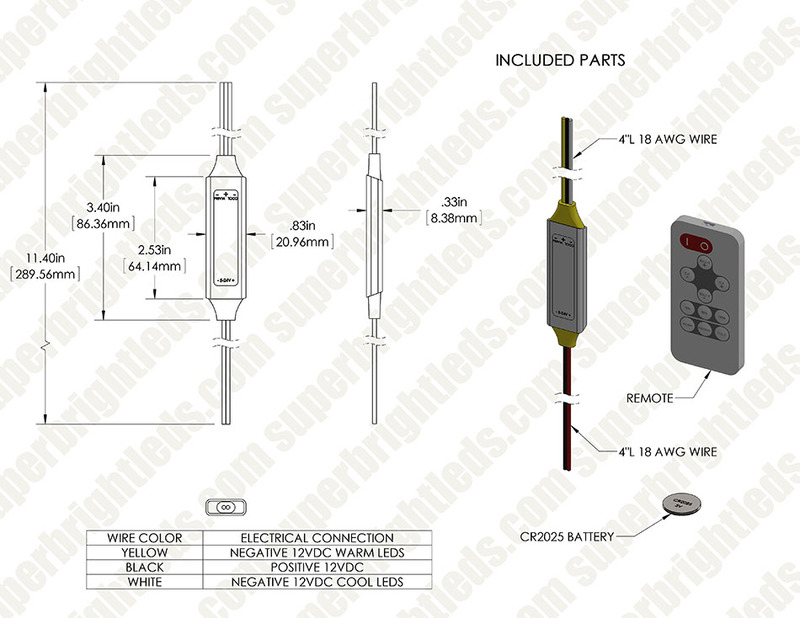 The remote uses a 3V CR2025 battery. 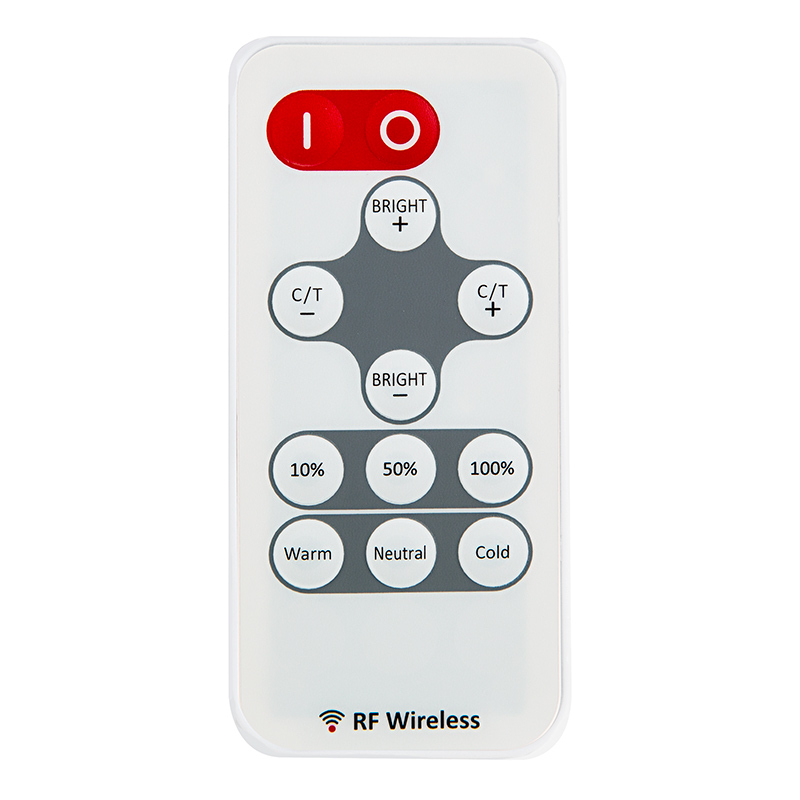 Note: The wireless remote operates using radio frequency(RF). The remote controller’s use is not restricted by normal obstructions such as walls, doors, etc. Do not install controller in metal enclosures. Remote power of the controller and restore power again after 5 seconds. Press remote 'C/T+' and 'C/T-' key together in 5 seconds after power is restored. After this operation, the main unit indicator will flash white 3 times, the master unit now recognizes the new remote. Only 5 latest paired remote controllers can be recognized by main unit. Works as described. I completely tested on workbench before installing LED's under kitchen cabinets. Very easy installation once I figured where I was going to run the wiring to the LED's. This product works great and is so compact. All my customers love it.